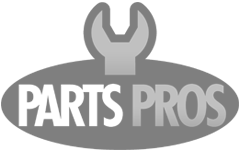 PartsPros.com specializes in formerly dealer-only auto parts. We carry the parts that your local big-box retail parts stores don't. We have a huge selection of replacement lighting, door handles, tailgate parts, window regulators, and dash covers. We also offer many other quality products such as side-view mirrors, exhaust manifolds, engine parts, multi-function switches suspension parts, carpet sets, and so much more. Our goal is to provide our customers with a comprehensive inventory of commonly needed parts that you will not find available at your local parts store. Here at PartsPros.com we are also committed to living up to our name. All of our customer service reps are extremely knowledgeable in automotive parts, service and retail. Our customer service reps average 15 years of experience in the automotive field. We only hire experienced parts countermen to serve our customers, so we can provide the best advice both before and after the sale. When you shop PartsPros.com, you are only a phone call away from a professional. If you are local, we would love for you to stop by our retail store at 400 Mecca Street in Lafayette, Louisiana. We are open 8:30-5:30 Mon-Fri.
We first opened our doors in January of 2003 with a simple philosophy: Bring our customers top quality auto parts at great prices while providing unparalleled customer service. Over 100,000 satisfied customers later, we are still just as committed to providing the absolute best service in the industry with the highest quality new aftermarket auto parts available at very competitive prices. We have also designed our web site from the ground up to give our customers a simple way to find exactly what they need without having to sift through pages of irrelevant information. Professional grade parts, professional grade service, these are the reasons why so many of our customers keep coming back to the Pros. *Free shipping only applies to ground shipping within the Continental 48 United States.